It's not really all that clear why Antonio Elia Forte emigrated from the sun-laden Lecce in Italy to a compact bedroom in London's Whitechapel area - not simply an abode but also an improvised recording studio. Perhaps it was Forte's way of invigorating his creativity, and the resulting debut Echopark album is a suitable reward for his efforts, bearing reminiscence to the likes of Animal Collective and Youth Lagoon. Forte's story echoes musician Alessio Natalizia's move to London from Italy, with his music also sharing a similarity to Natalizia's hushed vocal-led lo-fi output as Banjo Or Freakout. 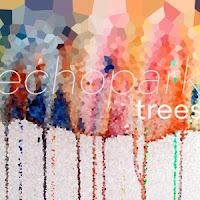 Nonetheless, 'Trees' makes it clear that Echopark wishes to make his own statement, beginning with the strangely tense opening on 'Cranes' - the beats rapidly pounding away in contrast to the serene vocals. 'Cranes' isn't the only track to prove somewhat befuddling, with the off-kilter 'Youth And Fury' and the curiously painful 'Waves' coming later in proceedings. The latter track almost seems deliberately provocative and challenging before thankfully ceasing abruptly. Echopark's best work comes in his bouncier offerings, such as the upbeat shoegaze-influenced 'Franky' and the driving 'Mountain'. The two tracks to emerge before the album was released are equally as compelling, the Animal Collective-esque 'Teleportation' and the pulsating electro-pop of 'Gray Clouds' - wise choices as an introduction to Echopark. Perhaps unfortunately, the lyrics on the album are often lost in the haze of the vocals - yet the haphazard production adds a charming glow to 'Trees', and an aptly intimate feel considering its bedroom foundations. Purchase 'Trees' at amazon.co.uk. Echopark plays a free gig at The Old Blue Last in London tonight.